It looks like Ruckus took stock in the immortal words of Harvey Penick when he said, “Take Dead Aim.” No longer leashed to a controller, Ruckus’s new Unleashed controller-less Wi-Fi solution aims squarely at the SMB. Full Disclosure: I’m not being paid by Ruckus (or anyone else) to write this blog. After playing with the solution extensively, I felt it worthy of a good blog. Enjoy. Ruckus has repurposed their R500 and R600 (one of my favorite APs in the market) to become what I would deem an excellent mid-market solution – certainly one that I can recommend to my customers. These APs support PoE or AC power and are small, thin, nice looking, and have excellent performance. The Unleashed system supports up to 25 APs and 512 client devices, where all APs can serve clients. Considering roughly a 3:1 device-to-user ratio, Unleashed could support organizations in the 150 user range. You have to factor in some additional devices for guests, contractors, and the like as part of the overall equation. To be fair, 150 employees is a pretty sizable company. 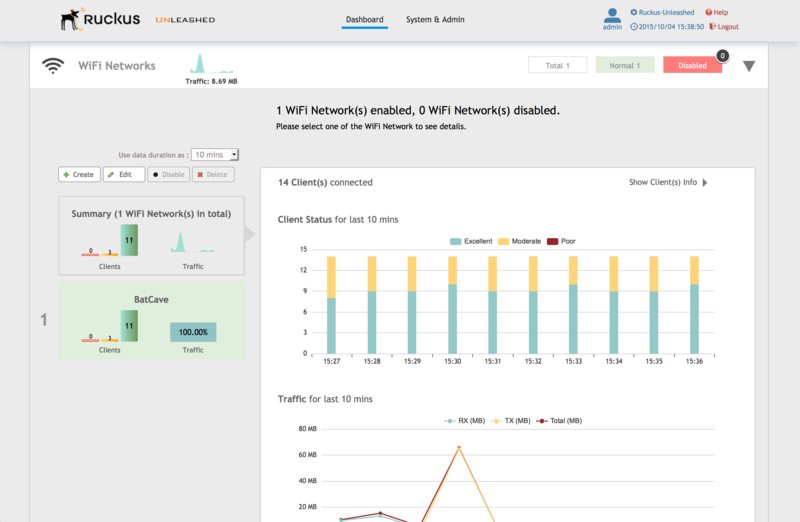 If you’re looking for inexpensive and simple-to-deploy public access Wi-Fi, Unleashed would certainly be cost effective and easily scalable enough. Think restaurants, coffee shops, retail stores, home & branch offices, and other single-site businesses. I’ve been using Ruckus’s ZD1200 controller with a variety of APs (R600, R700, R710) at home for some time now, and it’s been rock solid, feature rich, and super fast. I was hesitant to swap it out with Unleashed because my home network is mission critical for my company and family. I’m happy to say that I’ve had no connectivity or performance problems with their first release code. How often can you say that?…about anything? 🙂 Kudos to Ruckus’s QA dept. There are a few features & views in the ZD1200 controller that are not yet available in the Unleashed product, such as easily being able to tell what channels (and channel widths) are in use by APs, but they’re probably forthcoming. That said, the system is still very feature-rich. For example, it has key features such as BYOD on-boarding (called ZeroIT Configuration), DPSK, and DNS-based Application Recognition & Control. 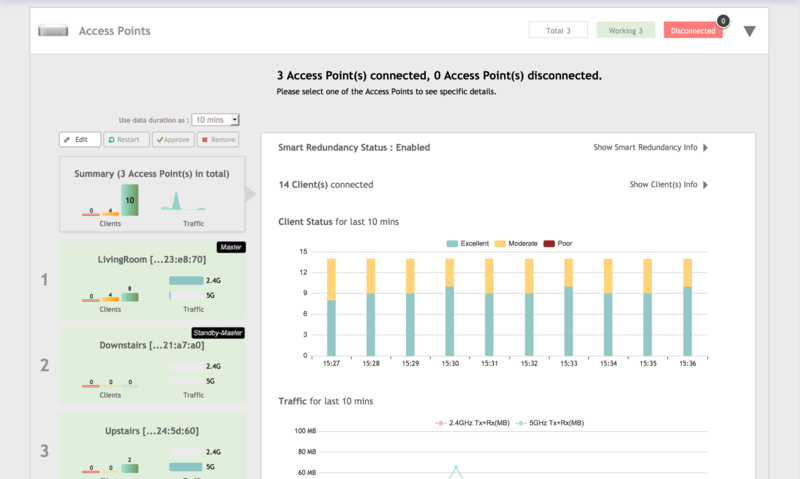 You can figure out the channel info by using a scanning tool like Wi-Fi Explorer or by looking at the client device details in the GUI to see which AP it’s connected to and the AP’s channel info. That’s a little wonky IMHO. I’ve already provided that product feedback, and their product management team seems very eager to listen to feedback. Again, kudos. Not needing a controller (or AP licenses!) cuts cost and offers inherent redundancy for deployments of up to 25 APs. If you want to scale up to 75 APs, then you would move to the ZD1200, which I really like. It’s a FAST and cheap little controller. As a bonus, Unleashed APs can be converted to controller-based APs if you’re ready to scale beyond 25 APs on your network. Up to 75 APs is clearly an SME play, whereas Unleashed is targeted at the SMB market. Unleashed setup is dead easy. Power up any number of Unleashed APs, wait a couple of minutes, look for the Configure.Me-XXXXXX SSID, connect to it, browse to unleashed.ruckuswireless.com (which is the GUI provided by the Master AP), and voila. 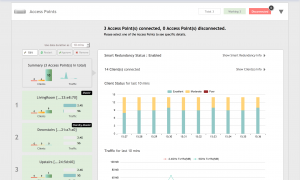 You’re instantly ushered into a simple wizard to configure your APs. The Master and Standby Master are automagically configured upon boot-up, so you don’t need to worry about anything like that. If you want to configure individual APs, then just click on it’s big green block in the left pane, and click Edit. Easy. If you want to configure an individual network (SSID), just click on it’s big green block in the left pane, and click Edit. Easy. Ruckus’s marketing literature says that it only takes 60 seconds to get the Unleashed solution on its feet once the Master AP has been selected. I can agree with that specific wording because configuration itself is very simple with Unleashed. It took me less than 10 minutes to go from power-up to surfing (with all features configured like I wanted them across 3 APs) because the Master AP’s initialization process takes 3-4 minutes and AP power-up takes a couple of minutes. Still, it’s less than 10 minutes. That’s pretty impressive for fully-configured, mid-market class Wi-Fi in its first generation of code. I don’t remember having seen a faster initial configuration in my 15+ years in Wi-Fi. It’s pretty obvious that much thought went into the initial configuration and deployment process. One thing I really like about the GUI is that it’s super fast navigate to whatever you’re looking for. It’s also fairly intuitive. I say “fairly” because you have to initially poke around in the GUI a little to figure out where things are. Features aren’t always where you would hope for them to be. Still, it’s not difficult at all. If you can figure out a Linksys Wi-Fi router, then you can figure out Unleashed. AP configuration can be done individually or in AP groups – just like with the ZD1200 controller. That part is very easy and intuitive. All channels and channel widths are individually selectable (awesome!) in AP groups and on individual APs (via overriding the group settings). Love it. One feature missing in the Unleashed GUI, that’s also missing from the ZD1200 GUI, is the ability to configure individual BASIC and SUPPORTED data rates. That’s really needed for mid-market administrators. I certainly understand the desire to hide configuration complexity, but at the same time, it feels like someone is taking away my ability to manually shift gears in my automatic transmission car. You might not always want it, but it’s really good to know that you can tweak things if you need to. Radio Resource Management (RRM), which controls AP channel selection and output power doesn’t seem to be great at choosing the optimum channels just yet. The ZD1200 is consistently accurate at choosing optimum channels. Unleashed is initially picking overlapping channels and then not changing them appropriately over time. I’ll tinker with this a bit more and report back with my findings. I’ve already let the product management team know. It’s super simple to manually configure AP channels, so this is just fine for now. So far, my experience has been excellent – perhaps an 8 out of 10. If it gets the message across, Unleashed is still my home Wi-Fi network. J Unleashed isn’t flawless just yet, but it is very impressive as-is. It really only needs minor polishing to be SMB Wi-Fi product quality leader. If you’ve been in the Wi-Fi market for very long, you know that Ruckus is a little late to the controller-less game. Given their late entrance, it’s very good to see that they’ve taken the time to get it right before launching it rather than taking the industry’s typical road of relying on customers to be unsuspecting beta testers. Very happy to see this commitment to quality. I’m interested to see how things play out with Xclaim Wireless (a really nice Ruckus-owned, cloud-managed, SMB/SOHO play) versus Unleashed. The cost model of the two solutions is very different, and while Xclaim is using R300 and R500 hardware, they’ve disabled Beamflex+ in the Xclaim product. Xclaim APs also don’t have a shared control plane, but rather act as cloud-managed autonomous APs. The Xclaim -> Unleashed -> ZD1200 progression is like ‘AP carpet bombing’ – something for everyone, regardless of economic, scale, or sophistication requirements. Ruckus seems to be making really smart product decisions these days. I would spend my hard-earned money on Unleashed, without even a second thought. It’s money well-spent. Nice work Ruckus. You have a winner on your hands with Unleashed. Thank you and nice write up. I setup 2 R600s in my small office on what seems to be a popular opinion that these (using Unleashed) are good products. While I agree with most of what you said, does no one else have problems with roaming? My devices seem to stick to whichever AP they first connect to. I can sit on top of the 2nd AP and it will stay connected to the 1st one even with a weak signal until I manually disconnect and reconnect to the network.